Brooke’s traditional piñata and candy for her birthday party are all ready to go. Remember when my sister and I ran a half-marathon dressed as piñatas? I had a Potbelly’s sandwich the night before my PR 1/2 marathon a few weeks ago and so I am hoping it will do the trick for this morning’s long run too. Hitting up the massage chairs across the street the night before my long run was also a really great idea. And then we played minesweeper for way too long… that game is addicting. Because a few more carbs before bedtime were needed. Stuff is all laid out and ready to go. It’s going to be a tough one but my dad will drive along with some gatorade so I am excited for that. Two new songs for the playlist… HERE and HERE. 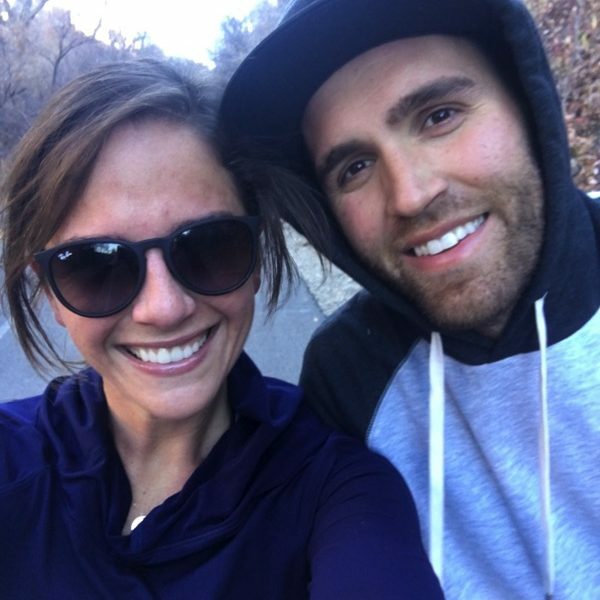 20 Things You Know When You’re Dating a Runner—> Yes, yes and yes. Came across this picture of baby Brooke in her absolute favorite onesie. Current top 3 favorite carbs? Ever ran a race in a costume? What were you dressed up as? Addicted to any games on your phone? Give me your sentence for the day! Hot spots, DO NOT END and a goal accomplished. Running deposits, a moose on my run and it arrived. Tempo run #1 done and WHO CARES!?! bagels, bagels, oh and more bagels. Ran a 1/2 once as a sailor. I got a PR! Loved it. I haven’t played minesweeper in forever! I’m addicted to bejeweled. I don’t play it everyday but I can definitely get sucked in! I should have gone to bed earlier. The morning came too fast! Good luck on your run! That sandwich looks excellent. I had a Wegmans bagel before my last running PR. It’s so weird to believe that’s what I had because that’s not normal for me at all. Oh well, it worked! I’ve dressed up for many different races and I love to do it! In fact I think it makes racing more fun! That onesie is adorable and so true! My favorite race costume was when I dressed as Minnie Mouse during the Disney Princess Half Marathon … except my mouse ears started bothering me halfway through and I had to ditch them! I’m not big on wearing costumes but when in Disney you HAVE to!! Bagels, Wheat Thins, and really any bread. I once ran a race dressed as Wonder Woman. And another as a fairy. Sentence for today: I am going to love people no matter what. Favorite carbs: sweet potatoes, oatmeal, brown rice. Never raced in a costume. Sentence of the day: need more sleep! I give so much credit to people who run in costumes! 3 favorite carbs lately are japanese sweet potatoes, plantains, and bananas. I ran a Halloween race as a cheetah one year. Sadly, it still didn’t make me fast! That’s so sweet that your dad drives next to you. What a guy! I have been in a words with friends phase for quite some time. My sentence is am I the only one who injured themselves in their sleep? I woke up to a muscle spasm in my calf. Must have had tense dreams. Run as piñatas again, only this time, you need to carry a (soft) stick!! See if they’re filled w/candy. I love old pictures of Brooke! So cute, and that onesie is perfect. I only have one game on my phone but I play it all the time! It’s called threes (similar to that really popular game 2408) and I love it. Sentence for the day: Thank goodness it’s almost the weekend and the mornings are cooler! Katherine @ Sweet. Southern. Run. Top 3 favorite carbs – veggie pasta, tortillas, and rice-a-roni! Sentence – When I walked outside to let the dogs out this morning, it felt like it was 65 degrees out so that must mean fall is coming soon and that makes me happy! Current top fave carb: pain aux raisins…think croissant combined with a custardy raisin danish…only more delicious than that sounds. Where is your turquoise bracelet from? I <3 it! All the carbs are my favorite carbs. It’s a good thing I’m a runner or I might be really fat from it haha. Brooke’s onsie is so cute. I want one next time I have a baby. Donuts sound good. And I want some today. Have you ever tried Potbelly’s chicken salad? It’s my go-to. So delicious. Also their cookies are faaanntastic. Favorite carbs: RICE, crackers (with cheese), and probably bagels. I’ve been toning the carbs down since I’m not running yet (ugh), and it’s honestly made me so sad hahah. I miss them. I ran as Santa once, and I will never do it again. It was only a 5k but I was far from jolly by the end of it. Sentence for the day: MAKE IT TO FRIDAY! Have a good one :) Good luck on your long run tomorrow! P.S. When I get back to running I’m 10000% ordering those Pure Cadences. I’ve been eyeing them for like a year now, but after seeing how much you love them I have to do it now. My sentence- I want to go back to sleep but can’t! So sweet that your dad drives with you- good luck on your long run!! Like you I have weekend plans and have to do my 20 miler on Thursday. Do you think a 19 miler Saturday and a 20 miler Thursday are too close to each other? It’s inevitable during training to have to switch up your plans here and there, but I’m a little worried. I’ll only have 4 days in between the 19 and 20 miler and that will include a speed day, tempo day, an easy run day and cross fit. Do you think the long runs are important and that I should get them both in and maybe take out the tempo run that I’d do Wednesday? I don’t think they are too close together. Although I do think doing speed work and a tempo run in between will = very tired legs. I’m not a coach or anything but speaking from experience (I’m currently injured ?) I’d probably do the 19, sun- cross train (swim or bike for recovery), mon -cross fit, tues-tempo, wed another cross train, then kill that 20 on thurs. Sentence: I’m so happy to be back home, run with my friends, and have breakfast after!!! Only 3 carbs?! Bagels, pizza and oatmeal, if I have to pick three! Cereal is a close fourth. I am still addicted to Candy Crush on my phone… I know. That was so two years ago;) and no I will not send you annoying Facebook requests!! restaurant bread and butter or dipping oil. any type of morning muffin: banana, blueberry, carrot, lemon poppy seed……I don’t discriminate. I need a lesson on how to tame the carb intake with upping milage…….wowzers they taste good! You’ve got a tough run ahead of you, the cereal was probably necessary! All the cereal. No box is safe near me! Top 3 favorite carbs: bagels, oatmeal, and cheerios! I have never ran a race in a costume. I am going to run a Halloween 5k this year so I will dress up for that! I don’t play any games on my iPhone. I was addicted to Trivia Crack for a while. Sentence for the day: I had an awesome 10 mile tempo run this morning and am now going shopping for some decorations for my new living room! I ran a spartan race dressed up as supergirl. I had been craving a bagel for weeks so when they showed up at work yesterday I had one. It was amazing! Sentence for the day: I’m going to enjoy the sunshine after work. Aw she was so bitty! Carbs: pasta, bagels, bread of all kinds. <3 So much carb love. 3 fav carbs: chips & salsa (or guac! ), Cinnamon Life, and homemade tortillas! Sentence of the day: I’m thrilled that my body is healthy enough to run and start thinking about training for another marathon! Good luck on your run today!! I’m sure you’ll rock it! favorite carbs: pasta, bagel and oatmeal. Never raced in a costume…seems like it would be too uncomfortable. My one sentence: MY SON COMES HOME TOMORROW!!!! (he has also been gone this past week with his dad). Garlic Jim’s breadsticks, Garlic Jim’s pizza, and Noodles & Co. It’s been a real healthy week. I did a walking relay in a tutu once. That’s as exciting as I get. Our office is moving today and work is total chaos and I just want to go back to bed! I love the pinata costumes. I’ve never run in a costume and not sure I would. Top 3 favorite carbs are mac and cheese, bananas, and bagels. Hmm it’s hard to think of just one sentence for today. Probably “Get back to work, you have a lot to do before you leave early tomorrow.” I’m taking a long weekend to explore Philly but have a lot I should wrap up here first. I do NOT like dressing up in costumes! I don’t like Halloween. Ha! I used to play minesweeper ALL THE TIME. It got bad and I started playing it whenever I would look at tiled floors haha. Can you believe Brooke is turning another year old? Time really flies doesn’t it? Top 3 favorite carbs equal oatmeal, popcorn and sweet potatoes. My sentence: Long run tomorrow, need carbs today! Wait, are you going for a 2:55 now? Isn’t that what you’d get with a goal MP of 6:45? Love love love all carbs :) Favorites (in ranked order): Bread rolls of any kind … Particularly love sour dough or ciabatta … Buttery, fluffy biscuits … And then I love eating my mom’s pasta when we go out to dinner because everything just tastes better off her plate. Question: Do you usually do two long-runs a week or just one? If you’re doing 16 today … Do you also try to get in a weekend long-run? I started testing out the midweek extra mileage but only have been going around 10-miles. Omg I love that you guys ran a race as pinatas!! haha Too cute! I ran two different 5k Halloween races in costume – one as a pirate, one as a cow. I totally forgot about minesweeper. Before cell phones came along this used to be my favorite way to pass time!! My sentence of the day is actually a quote as well as my email signature. I absolutely cannot run in a costume. I am as free as possible when I run. From the very beginning I have kept it simple. Side note: I love the two songs. I’m a huge Jay-Z fan. I hired a string quartet to play it at my wedding… Really. I need that sparkly sports bra in my life. Where is it from?? Bread, potatoes, french fries. Those all count right? I ran a half near Halloween and wore a jack-o-lantern shirt! I love dressing up! I was a skunk for one and then my sister and I dressed as Mario and Luigi for another, so much fun! I love cafe rio pork salad. That is my perfect carbs! I dressed up as rapunzel last year for a Halloween race. Fav carbs…..PASTA, sweet potatoes and a Panera cinnamon crunch bagel. I was sporting a Donald Duck inspired costume for WDW Half last January. He is my absolute favorite character. And that half IS his race. Love the picture of you and your sister as pinatas! And my sentence would be, “It’s Date Night! !,” said in an over-the-top Oprah Winfrey introduction voice. :) ha. 3 fave carbs, hmmm…gah i’m not a big carb person! tortilla chips would probably be all 3. sentence for the day (from my small group the other night and been on my mind all week): DREAM BIG. Favorite carb??? I don’t discriminate. I LOVE ALL THE CARBS :) But if i must pick one…cereal. I flipping can’t get enough cereal! And strangely, I like it better dry! Thursday will be full of swimming and sunshine! I ran my first marathon (WDW in January) dressed as Princess Belle! LOVE the picture of baby Brooke! I remember when you called her Spiky! So CUTE!